It’s April, and just under a month since the end of the 2019 Free Exchange Conference: Community Building as Resistance. If you are reading this, you’ve stumbled upon / returned to the Free Exchange website during the spring and summer months when most of the work is being done behind the scenes. This year has been a challenging, rewarding, and amazing experience and I cannot put into words how grateful I am to all of the amazing people who came and helped and participated. I am honoured, excited, and anxious to take over the role of returning chair; Benjamin Groh has done an incredible job this year and I can only hope to fill the very large shoes left behind. Here’s to an amazing conference, and hopefully many more to come. With readings by Kaitlyn Purcell, Paul Meunier, Dania Idriss, and Erin Emily Ann Vance. Followed by a social at the Last Defense Lounge at 8:30. We are just three weeks away from the conference! We cannot wait to welcome everyone to Calgary. In the meantime, check out our Program! On Wednesday, January 23, 2019, the Free Ex team will be hosting our annual fundraiser at Shelf Life Books (100, 1302 – 4th Street SW, Calgary, Alberta T2R 0X8). General Admissions is $15, with tickets available at the door. (Eventbrite tickets are also available.) The event starts at 7 pm, with doors opening at 6:30 pm. After Roy recognizes that such a turn towards community should “come from the starting point of disciplinary knowledge, rather than from problematic volunteerism or service frameworks,” these two trends—a reliance upon neoliberal capital and a turn toward community—appear even more at odds because they resist one another. Can literary study—either within or outside of the academy—assist students, scholars, activists, and artists as they build a praxis of civic and community engagement? How can literature re-activate a sense of community (both local and planetary) in a world dominated by global capitalism? 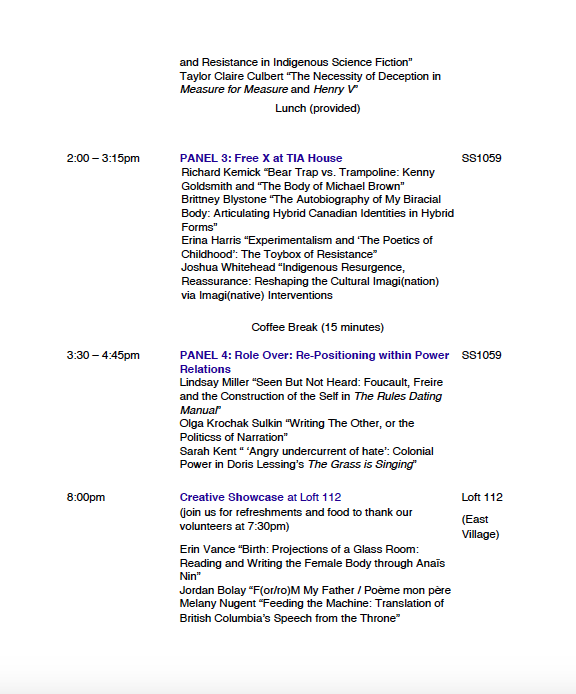 The 2019 Free-Exchange Interdisciplinary Graduate Conference at the University of Calgary invites graduate and senior undergraduate students to propose presentations about the relationship(s) between community and literature. How does literature represent communities? How does literature form communities? What does literature teach us about communities and how these communities form? What is the reciprocal relationship between literature and community? How can literary community-building become a form of resistance? What can resistance look like? And how does resistance-as-community operate? We want to hear about your thoughts on community, literature, and resistance. We are interested in both critical and creative presentations from scholars in all disciplines. For academic papers, please submit an abstract of no more than 300 words. For creative projects, please submit an artistic statement of no more than 200 words and a sample of your work (and list of publications, if applicable). All submissions are to be sent in an electronic e-mail attachment to freeex@ucalgary.ca and are due no later than January 14, 2019. Ben was the 2017-2018 Co-Chair, and Shuyin will continue as the 2019-2020 Co-Chair. Free Exchange is just around the corner! Free Exchange is just over a month away, and judging by the strength of the submissions in our burgeoning inbox, 2017 is going to be a banner year for our Graduate Conference! Details are still being finalized for the weekend, but a lot of people have been asking about the schedule, so we wanted to at least give a rough idea of our tentative timetable. Please note that in several places final arrangements are still being made. Some of the locations and times are not set in stone quite just yet and there may be some reshuffling as we get closer to March. Stay tuned, and follow us on Twitter and Facebook to make sure you don’t miss anything! This will be at Dickens on the corner of 9th St and 9th Ave SW, and is a collaborative event with the Fairy Tales Film Festival which runs every year in May in Calgary, showing films by LGBTQ filmmakers, or with LGBTQ themes. On Thursday night we will be showing a series of five or six short films (5-15 mins each) which address the conference’s theme of relationality in different ways. We have booked the space from 6-9pm, and aim to begin the screenings at around 7pm. We are hoping this event will get the weekend off to a flying start! We are delighted to announce that our keynote speaker this year is Dr. Stanka Radovic from the University of Toronto, whose gift for discussing complex pop-cultural texts in the language of critical theory makes her one of the most singular and powerful voices in the Canadian academy right now. Following the keynote we will have a catered reception which will likely run from around 4.30-6.30pm. Food for the reception will be provided by Ethnicity Catering at the Centre for Newcomers, a social enterprise that provides employment opportunities for recent immigrants to Canada. We have used them several times in the past and their food is always exquisite. We have a night of creative presentations planned for Friday evening. The strength of the creative writing side of graduate studies in the English department means that we will, as usual, have a large number of excellent authors and poets taking part. We are still nailing down the location for this at the moment. We’d like to have it in the Red Bush Tea and Coffee Company in Kensington, which has a perfect upstairs space, but we may end up having to hold it across town in Loft 112. Start time for this will be around 8pm (maybe later if the keynote reception runs late) and we expect it to go until at least 10pm. We’ll have a second creative night on Saturday in order to give all the creative submissions for this year’s conference a chance to shine. We’ll gather from about 9am in ST 131 – you can find it here, if you select “ST – Science Theatres” and then room number “131”. Coffee, bagels, donuts and other breakfast goodies will be provided to help people warm up. Our first panel will probably start around 9.30am, and we aim to have four full panels (of 3 speakers + chair each) throughout the day. We’ll break for lunch from around 12.30 to 1.30pm, which will be sandwiches and wraps supplemented with plentiful cookies, fresh fruit, and veggies. Panels should end around 4.30-5pm on Saturday and there will be time for some hot dinner (once again provided by Ethnicity, and held in the TIA House space) before the Saturday night creative event starting at around 7.30pm, which we plan to run in concert with the Flywheel reading series (associated with Filling Station magazine). Location for this is also still up in the air, Pages bookstore in Kensington seems possible, but if not, then the two locations from the previous night remain as backup possibilities, and also Lot 102, which Flywheel often uses for their events. This will kick off slightly later (say 10am) to give people a chance to reckon with the clocks going back overnight. Once again in ST 131 we will have coffee and baked breakfast goods, and we aim to have two panels during the day (depending on how strict our vetting committee is next week). This session will conclude with closing remarks. 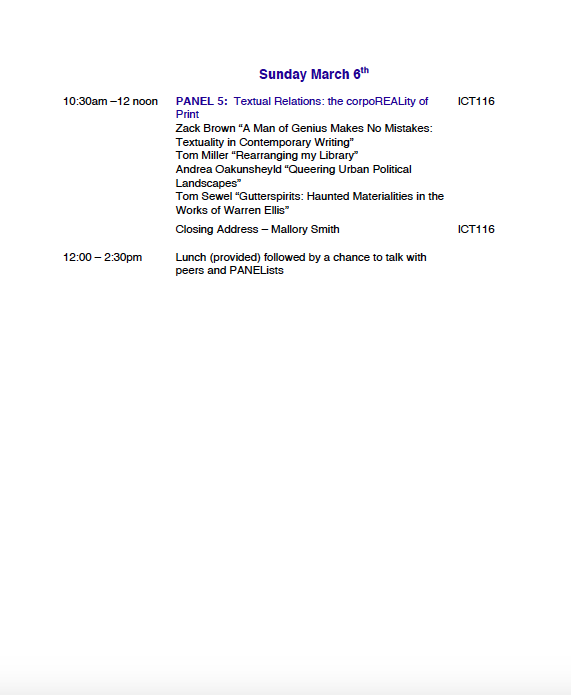 This is the end of the conference proper, but we have planned a post-conference sumamtive plenary session, which we’d like to hold in the Judith Sloman reading room from about 3pm to 5pm, and which will be chaired by three of the department’s more recently-hired professors. The idea here is to provide a space to reflect on and unpack some of the ideas that were raised over the course of the conference, with discussion guided by three professors who are relatively new to the department. On Sunday evening, we have tenuous plans for a showing of visiting Writer-in-Residence Shane Book‘s short film Praise and Blame – but again, we are still working out the details of exactly when and where. It may prove not to be possible (Shane is out of town for most of the weekend) but if we can make it happen, we’d love to round off a hectic few days with a slyly subversive and outright hilarious short film (and perhaps a drink or two afterward). So, we realize that some of this might sound rather hazy at this stage, but the work of getting all our ducks in a row goes on, and whatever happens we can assure you that this year’s Free Ex is going to be a fantastic experience for everyone involved! Hello again, all friends of Free Ex! As summer dwindles and groans under the weight of the approaching fall, we solemnly gather to recognize that the way to Free Ex 2017 now lies open. We bid the fondest of farewells to outgoing co-chair Mallory Smith, and wish the warmest of welcomes to incoming co-chair Will Best, who will be working with continuing co-chair Tom Sewel to organize and deliver this year’s Free Exchange Graduate Conference. We are of course still in the very early stages of planning this year’s conference, but we have a couple of events coming up soon which you should know about! This Thursday at 2pm, (tomorrow, as of this writing) Sept 29, in the Judith Sloman Reading Room on the 11th floor, we will be having our first Free Ex meeting of the year – the traditional brainstorming meeting where we throw around ideas for this year’s conference theme and title. These meetings tend to be more successful the more people who attend, as the flowing of the creative juices quickly kicks off a chain reaction! Plus, for the first time in five years, this year’s brainstorming meeting will have to come up with the goods in the absence of legendary former Free Ex chair Jess Nicol, who has other obligations to attend to. This means that now, more than ever before (in the last five years) we need YOU. We need your input, your ideas and your critique, to make this year’s Free Ex the best it can be. This Thursday we need to have a theme and title settled before 3.30pm, so there is some urgency to this meeting. Next Thursday, October 6, at the same time and in the same place, we plan to have our CFP meeting, where we will assemble the committee responsible for drafting our Call For Papers and have them do the work of generating this crucial element of the conference. Stay tuned for more details about that meeting as they come in! We are thrilled to be back, and look forward to seeing all of you get involved in putting on a spectacular Free Ex 2017! In the meantime, follow us online! Our 2016 CFP is posted here.